(multiplication of names, cascading rank changes, shifting taxon name endings, inappropriate comparisons based on rank) that arise because of the Linnean system being based on a set of internested ranks. What this implies, of course, is a different set of priorities about what taxonomy should be communicating from those who wish to at least partially mirror the pattern of relationships. Workers who object to phylogenetic taxonomy list as one of their key criteria for a nomenclatural system "high hierarchical information content" (Liden et al., 1997: 735). Phylogenetic taxonomists, on the other hand, prioritize giving clades and species "names that explicitly and unambiguously refer to those entities and do not change with time" (Cantino and De Queiroz, 2000: 3), at the expense of having interrelationships between the names themselves communicate anything about the hierarchical pattern of relationships. Names in phylogenetic taxonomy must be associated with a particular ancestor, so that membership in a group implies common descent by necessity. In this case the distinction between definition and diagnosis is clear—the definition of the taxon is a statement indicating to which ancestor the name refers, while the diagnosis is a list of characters that can be used to recognize members of the group. Within the context of the Phylocode the name is tied to the definition, which is fixed, while elements of the diagnosis can change. There are three ways that the ancestor associated with a taxonomic name can be designated, depending on the desired composition of the taxon being labeled (Cantino and De Queiroz, 2000; De Queiroz and Gauthier, 1990, 1992, 1994; see Figure 1). The first is a node-based definition (Figure 1A): "the clade stemming from the most recent common ancestor of two other taxa" (De Queiroz and Gauthier, 1990: 310). A special case of the node-based definition is the crown-clade of Jeffries (1979), in which both of the taxa specified are extant. This approach has been applied to Mammalia (De Queiroz, 1994; Rowe, 1988; Wible, 1991), leading to the definition of this taxon as all the members of the clade stemming from the most recent common ancestor of extant Monotremata and Theria (Rowe, 1988). A similar approach for Primates could define the group as all members of the clade originating with the common ancestor of extant Strepsirhini and Haplorhini (assuming that both of these groups are monophyletic). Alternatively, a node (but not crown) clade could be defined based on the clade stemming from the most recent common ancestor of Purgatorius and Haplorhini (see discussion given in a later section). Figure 1. Types of taxonomic definitions advocated by Phylogenetic Taxonomy. The dashed shape surrounds the group being indicated by a taxonomic label. (A) Node-based definition: The taxonomic label refers to the clade deriving from the most recent common ancestor of Y and Z, but not any of the stem taxa from the lineage preceding that taxon. (B) Stem-based definition: The taxonomic label refers to the entire closed descent community (Ax, 1985) including not only the products of the most recent common ancestor of Y and Z, but also all taxa more closely related to this common ancestor than to X. (C) Apomorphy-based definition: In this case an apomorphy (indicated by the solid black bar) is used to delineate a common ancestor to the group indicated by the taxonomic label. The implication is that those members of the stem lineage that possess this apomorphy would be included, while those lacking it would be excluded, making this an intermediate between the node and stem based approaches. The second type of definition under the Phylocode is the stem-based approach in which taxa are considered to belong to a "closed descent community," (Ax, 1985; Figure 1B) or encompassing "all those entities sharing a more recent common ancestor with one recognized taxon than with another" (De Queiroz and Gauthier, 1990: 310). A useful example of this is Anthro-poidea, for which a stem-based definition could be constructed based on the clade including Catarrhini and all organisms that share a more recent common ancestor with Catarrhini than with Tarsius (modified from Williams and Kay, 1995; but see Wyss and Flynn, 1995). For Primates it would be possible to formulate the following definition: the clade consisting of Haplorhini and all organisms that share a more recent common ancestor with Haplorhini than with Scandentia. The precise composition of the resulting group will depend, of course, on the pattern of relationships supported in the systematic "gap" between haplorhines and scandentians, as discussed in later section. The third type of definition is apomorphy-based: "the clade stemming from the first ancestor to possess a particular synapomorphy" (De Queiroz and Gauthier, 1990: 310; Figure 1C). Unlike a more traditional approach, in which the characters themselves are diagnosing the taxon, in this case the derived feature chosen serves merely to identify a particular ancestor. One might define Aves, for example, as the clade stemming from the first animal to possess wings homologous with those in Archaeopteryx. This implies that you cannot safely use more than a single character to identify the common ancestor, since it is impossible to be sure that the features did not arise in a step-like fashion. For example, until recently it would have seemed quite reasonable to identify the common ancestor of Aves as the first taxon with wings and with feathers. With the discovery of a number of feathered dinosaurs lacking wings (e.g., Sinosauropteryx Ji and Ji, 1996), this became a problematic definition because the two features (feathers and wings) arose at different times, implying that the definition would point to two different ancestors. Using a complex characteristic that may have arisen in a step-like fashion could also lead to problems in attempts to identify a single ancestor. Wings might, therefore, be a poor choice since they are complex structures with many parts that likely did not appear in an instant. In fact, a recent discovery of an apparently non-avian dinosaur with four wing-like structures (Xu et al., 2003) demonstrates how complicated even this simple example could become. The same argument can be made for most characters considered "significant enough" to be the indicator apomorphy for a clade. 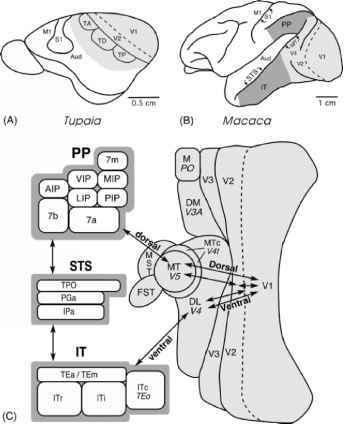 For Primates, one possibility would be to define the group as the clade stemming from the first species to possess a petrosal bulla synapomorphic with that in Haplorhini. There are several reasons why this is not a viable approach, however, as detailed in later section. By associating taxonomic names with the common ancestor of a mono-phyletic group, names cannot be applied to non-monophyletic taxa under the rules of the Phylocode, making it impossible to accidentally (or intentionally) name paraphyletic or polyphyletic taxa. In addition to doing away with ranks, phylogenetic taxonomy will presumably require uninominal names for species (Cantino et al., 1999; as it stands the Phylocode does not include guidelines for the species level) or, at least, that the first part of the binominal name not be considered to indicate anything about phylogenetic affinity or group membership. In this case, the species could include a "forename" or "praenomen" (following the terminology of Griffiths, 1976) rather than a genus name as the first part of the binominal.